Today, the world’s most prestigious fashion school Central Saint Martins is staging its BA Fashion degree show. 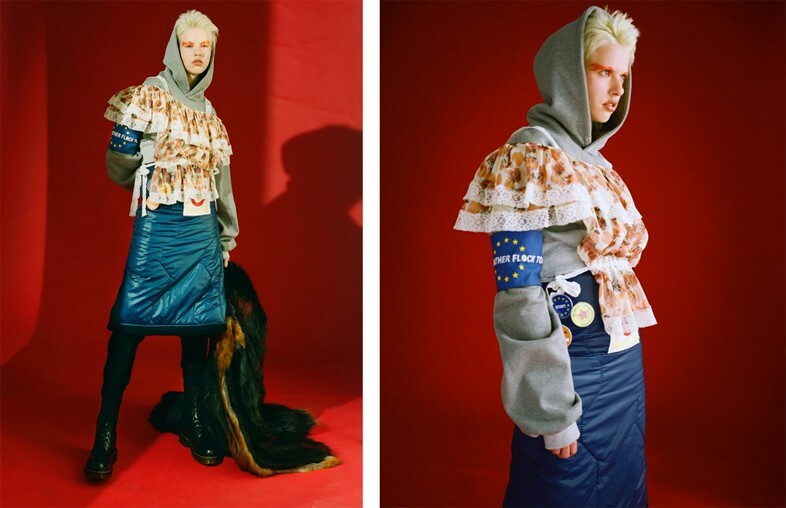 Among those showing is Philip Ellis, who originally hails from the Peak District and, since moving to London to study at CSM, has worked for cult label Meadham Kirchhoff and more recently for anonymous fashion collective Vetements. But there’s much more to Ellis than an impressive resumé – that much is clear from his stellar graduate collection, previewed here. 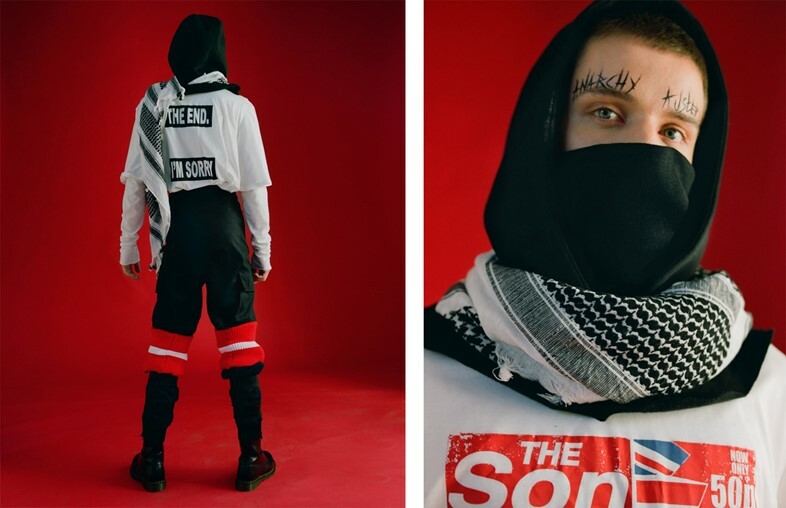 Taking inspiration from the multiculturalism of his hometown and the documenters of British subculture like Derek Ridgers, Ellis’s offering reflects his heritage, of which he is proud. And while it nods to the signatures of his former employers (like the genius textiles and pattern cutting of Meadham and the oversized silhouettes and street-led sensibilities of Vetements), his collection also has something refreshingly original. 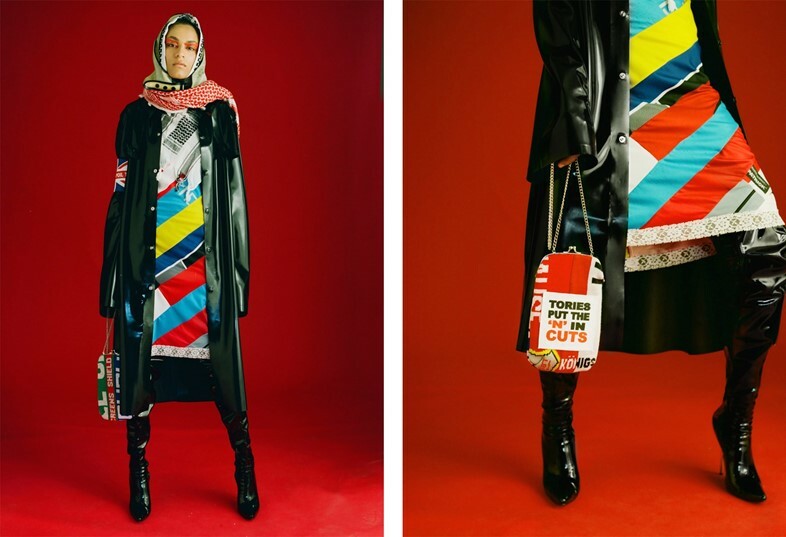 Unlike Vetements which prides itself as “just clothes”, Ellis’s designs have a decidedly political overtone conspicuous by the armbands, slogans and badges that adorn the garments. As the Brexit debate crescendos and the deadline for registering to vote in the EU referendum draws close (it’s June 7th by the way), Ellis’s stance is clear: vote to stay. Here he explains more. Why did you want to bring the EU angle into your collection? Philip Ellis: I just think that it’s something really poignant which is obviously what fashion’s about. I never used to consider myself to be a political person until the general election last year. I’ve decided to move to Paris as soon as I graduate and then there’s my friends on my course – some of them have come from across Europe, and they wouldn’t be able to study with me or live in London without the opportunities the EU presents. I think that, on a personal level, my life wouldn't be as great without the EU. If you had to give one reason to our readers why we should stay in the EU, what would it be? Philip Ellis: I think because the benefits of staying outweigh the negative aspects of being part of the EU. I think that if you’re born to make a difference, or are unhappy with policies, then something has to be done because leaving it will not make it any better. And how did you try and communicate your politics through your collection? 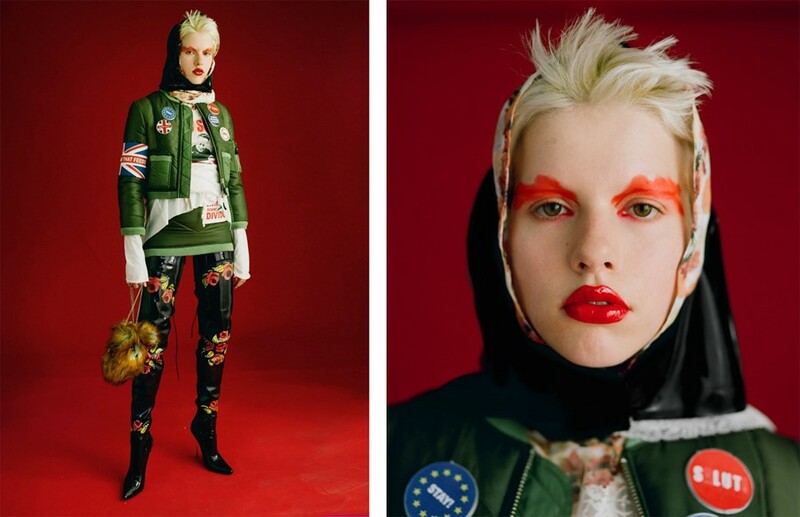 So do you think fashion can be a political medium? Philip Ellis: Yeah, I do. I think that clothes are one of the most powerful ways to communicate yourself and that, in a sense, fashion is inherently political. I think that I’ve been given a platform to express myself creatively and that it’s fitting to use it to communicate my political agenda. In your show notes, you talk about multicultural ideals – what do you mean by that and how have you express it in your collection? Philip Ellis: Well, I’ve appropriated the keffiyeh which is the traditional Palestinian headscarf. It’s not a religious item of clothing, but the weave is traditionally Palestinian and it’s become a symbol of Palestine around the world. However, my use of it has more to do with its military connotations. The British army appropriated the keffiyeh during the Second World War and now you can buy them in army surplus stores – that's where I sourced them from. I was also referring to the north of England, where I come from. It’s a massively multicultural place, and Islam is really important there. I’ve got a badge on one of my jackets and it says ‘Great Britain’ in Arabic on it. Philip Ellis: Yeah, it’s a badge on the Chanel jacket I made. And you referenced some great British photographers too – can you tell me a bit more about them? Philip Ellis: I am fascinated with British subculture. I’m really inspired by the work of Gavin Watson and Derek Ridgers, particularly their portrayal of punk which is an aesthetic I resonate with. And then there’s John Bulmer and his portrayal of the North which I massively referenced. And that’s also massively personal to me as I’m from the north. And there’s no place like home. What are your feelings towards the North? Philip Ellis: I think that in all things I trace my cultural heritage and I think that’s really important to celebrate. For instance, my show music is Joy Division and I almost went to the same high school as Ian Curtis. I sat the exam but didn’t want to go because it was all-boys. What were the best things Ben (Kirchhoff) and Ed (Meadham) taught you? Philip Ellis: The best thing they taught me was to be myself. They also taught me a lot of skill. Obviously, so much work and craftsmanship went into the collections, particularly pattern cutting and textiles. They really helped me with and inspired me. What do you think of Meadham Kirchhoff? How do you describe your feelings towards it? Philip Ellis: I love it. I think that it’s an institution and I’m very saddened that it was all sold over the weekend. But I think the legacy of Kirchoff remains and I really hope that they’re able to do things in the future. Do you own many pieces yourself? Philip Ellis: Yeah, yeah, I actually lent loads. You know the exhibition Mad About The Boy? Pretty much all of the of menswear Meadham Kirchhoff in that was mine. And more recently you’ve worked at Vetements? Philip Ellis: Yeah, in my second year I spent an entire year – 12 months – in Paris. First, I worked with Kim Jones and the men’s accessories team at Louis Vuitton. Then one afternoon I emailed Demna (Gvasalia) and he wanted me, so I got involved. Philip Ellis: It was great, they really involve you there. I loved the studio environment. Philip Ellis: It was really cool, full of loads of really young people. How do you describe the energy of it? Philip Ellis: It’s just very relevant. People are always coming in and out of the studio, and there’s a really nice communal aspect to it which is great. And unlike other French institutions that I’ve worked in, there’s no hierarchy. Are you planning on starting your own label at some point, or is this a one-time thing? Philip Ellis: For now, it’s a one-time thing. I think if I do my own label, it’s something I’d do in the future with financial backing, more knowledge and more experience. How would you describe your aesthetic or brand identity? I would say that it’s really British, to be honest. It’s really stereotypically British and I think I’m really stereotypically British. I think it’s obvious where I’m from and what I’m about. How are you stereotypically British? It’s my attitude, what I love to do, my appearance aesthetically and culturally. It’s a lot of stuff. I’m quite proud to be British and I think that comes across in my work.